Adding ten points to everyone's grade doesn't always work. If you give ten points to a student with a 93, she now scores better than perfect after missing 7% of the assignment. Ten points given to a struggling student who earned a 57 also isn't tremendously helpful. If you want to give the lower-scoring students more of a curve than higher-scoring students, use a sliding curve. 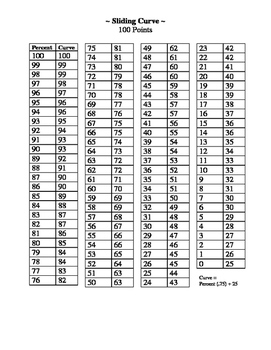 I've created a conversion chart where the highest score possible is a 100, and the lowest possible is a 25. Using this sliding point curve, a student originally earning a 50 now receives a 63 and student with a 90 receives an 93. Think of a sliding curve as a regressive tax system, where the relative tax burden decreases as an individual's ability to pay increases. Click Here to View My Store!